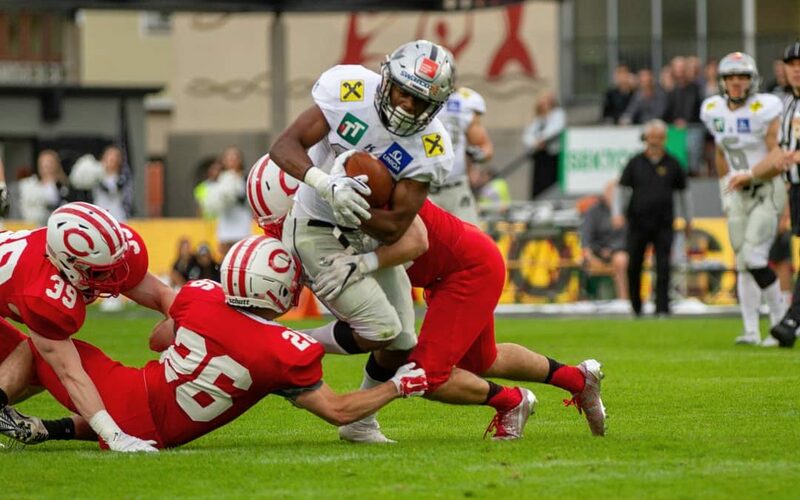 The final play of the game decided a thrilling clash between the Central College Dutch and the victorious Swarco Raiders Tirol in front of a 2,500 attendance at the Gernot Langes Stadion in Innsbruck, Austria on Friday. In possession of the ball with five seconds remaining and trailing by five points, Dutch quarterback Blaine Hawkins was sacked by Maximilian Wild and the Austrian hosts held on to win 31-26 as time expired. Last year, the Raiders led Benedictine College by 13 points, only to fall 31-27 at the death. The lead changed hands five times and even when the Raiders opened an 11-point advantage in the fourth quarter, Central College always looked capable of staging a comeback. The Dutch were handed a 2-0 lead when a high snap over the punter’s head conceded a safety on the game’s opening drive, after the Austrians had come out passing with Sean Shelton under center. Central produced a similarly encouraging first possession, but Patrick Pilger intercepted Hawkins as the quarterback rolled out to his left and threw across his body. The Raiders capitalized with Shelton to receiver Patrick Donahue a recurring theme, including a long seam route that set up David Oku eight yards from the end zone, which he duly breached. The extra point gave Swarco their first lead at 7-2. Raiders running back Oku (pictured) scored a total of three rushing touchdowns to win game MVP honors. The lead was extended to 10-2 through a 23-yard left-footed field goal from Thomas Pichimann after Central had turned the ball over on downs, in large part to a sack by Philipp Margreiter. Central mixed things up offensively with Hawkins under center and Thomas Fox lined up in the wildcat formation and the no-huddle proving effective. Passes to Erik Knaack, Logan Huinker and Caleb Schlatter moved the chains and Nathan Fitzgerald gained yards on the ground, before Hawkins stretched for the pylon to break the plane and reduced the deficit to two points. An attempt to steal the lead before halftime was halted by a Wild sack, so the hosts led 10-8 at the interval. Hawkins did grab the lead on the opening drive of the second half with a rushing touchdown, but was stopped on the two-point attempt, so the Dutch led 14.10. English quarterback Jerome Allen took over for the Raiders, who return to Austrian Football League action on Sunday, so rested starter Shelton during the second half. He handed off to Oku, who would have scored on a long rush but for a timely tackle by Jordan Borman. Allen instead went to the air to hit Donahue from 15 yards out and reclaim the advantage at 17-14. The momentum swung yet again on the Dutch drive in reply. A superb 43-yard Hawkins lofted pass over the Raiders secondary was reeled in by Brady Johnson, who beat the coverage to find the end zone and a 20-17 lead with the PAT blocked. The Raiders hit right back. Dutch linebacker Tate O’Tool made a last-ditch tackle at the four-yard mark as Donahue galloped into open field, but Oku was on hand again to score on first and goal, making it 24-20 to the Austrians. The Dutch fumbled away a positive possession and paid the price as Oku rushed for a touchdown and what ultimately proved to be a decisive 31-20 advantage. There was plenty of fight left in Central College as Hawkins connected with Schlatter to move into Raiders territory and Fitzgerald gained another first down on the ground. A long series of four attempts to score on fourth and goal within touching distance of the end zone, aided by an unsportsmanlike penalty, proved fruitless. So, Hawkins looped a third down scoring toss to Ross Norem and cut the Swarco lead to five points at 31-26. Allen took a sack at his own 40 to back the Raiders up as they punted late in the game and the Dutch had 1’47 to mount the winning drive. After a key Hawkins to Hunter Robinson gain, a pass interference call helped and at the same time infuriated Raiders coach Shuan Fatah, who might have sensed another lead over American opposition slipping away at the death. Second and goal with 16 seconds to play saw a dipping Hawkins pass just beyond Robinson bounce off the receiver’s hands in the end zone and on third down with 11 seconds on the clock, a pass was batted down and almost intercepted. Wild prevented Hawkins from getting off a final shot at the end zone and after a pause to confirm that a flag had been thrown for an offensive infringement, the Raiders celebrated a narrow victory.